Hello good people! It's nearing the end of the work week and we've decided to brighten up your weekend by giving you the scoop on our brand new (and fab) PRASM socks! For the most part we've been discussing, AND discussing some more about our unique line of PRASM belts and socks -with our multi-color belts as the primary focus in the past. However, today I am ecstatic to do a post specifically about our new and groovy, color-style socks! "Anklet" PRASM sock in blue! A few months back in a post titled, "The Metaphysics of Color," I touched on the importance and metaphysical properties of colors and the energies they enhance or promote. Well, that same color theory also applies to our socks, because they are equally as rich in color as our canvas belts! Why not draw in those same positive color vibrations for your feet, too?! Put some live, bold color on those weary feet and feel how uplifting and inspiring it is to take off your shoes after a long day and find a beautiful dose of color at your feet! "Low cut" PRASM sock in green! All of our lovely socks (and belts) featured on this blog can be ordered through the PRASM website! Our socks come in three different fits: low cut, anklet and no show. The "anklet" style sock gives your ankles a comfy little embrace and can be a creative touchstone for your casual attire. The "low cut" style sock shows just a hint of the material, which is great if you don't necessarily want your socks to overpower or take away from your attire. And last, but not least, there's our "no show" style sock. This style is great for those who want the comfort and support of wearing socks, but would like to create the illusion of not having any on! "No show" PRASM sock in purple! 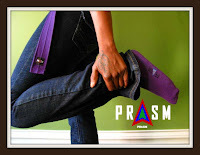 PRASM's multi-colored socks are "all season," designer style socks and are made of the highest quality ring-spun, absorbent cotton. PRASM socks are a great choice for the athletic or heavily active sort because the elastic at the ankle provides comfort, fit and superb shape retention. This means that they WILL NOT slip off your feet while you're in action! The high quality cotton blend is also a big deal because it eliminates color bleeding and shrinkage when you wash and dry your socks! A special side note: For those who are not yet ready to jump into PRASM's "color revolution," no worries... you can play it safe until you're ready to explore the more "popping" shades of color. A few neutral/basic colors to choose from would be black, brown or khaki (as featured below). "Anklet" PRASM sock in black. "No show" PRASM sock in brown. "Low cut" PRASM sock in khaki.